Love Bytes, Issue #011 -- Amazing dig find- How do I know if he really loves me? Tip: This ezine is a visual experience. Set your email to html instead of text only to enjoy our great graphics and photos. Gmail users: click on the Display Images Below link. In late 2006, in Northern Italy, during excavation for a new factory building, ancient artifacts were uncovered, turning the site into an archaeological dig (see photo above). 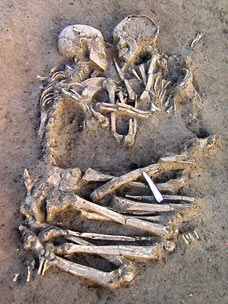 There, among flint tools, arrowheads and a knife, archaeologists unearthed two skeletons locked in a tender eternal embrace. The remains appear to have been from the Neolithic period, and are 5,000 to 6,000 years old. The site is outside Mantua, just 25 miles south of Verona, the romantic city where Shakespeare set the star-crossed tale of Romeo and Juliet. The pair are believed to have been a man and a woman and are thought to have died young, as their teeth were found intact, said Elena Menotti, the archaeologist who led the dig. Experts will now study the artifacts and the skeletons to determine the burial site’s age and how old the two were when they died. What a find! Although scientists feel it has more of an emotional than a scientific value, it sure lights up your imagination, doesn't it? Who were they? What sudden and tragic event caused them both to die young, and together? Was it another Romeo and Juliet double suicide? Scientists have already theorized that the man may have died first, and then the woman sacrificed to keep him company in his journey to the afterlife. Jeez! DNA testing may determine whether the two were related, but will not fill in the rest of the story for us. Alas, we may likely never know the true story behind this most moving display of true love. How do you know if you have found true love? Dear Stella, How do I know if he really loves me? The only real, accurate test for true love is the test of time. I would answer your query more accurately if I knew how long you and he had been going together. If you've only been dating a matter of weeks or months, it's far too soon to get serious and try to nail this guy down about his feelings. Let things unfold in their own good time. Love should never be rushed. Women are known to be impatient about this, they just gotta know, and most have learned the hard way that pressing the love issue too hard and fast can quickly destroy a potentially wonderful matchup. So, my answer to you is: wait and see. After the magical glow of infatuation fades, what is left? Do you find him less and less attentive; less and less affectionate, missing in action more often than not? Those are classic signs that he may be losing interest, and therefore not truly in love with you. * Have you two turned into best friends? * Are you comfortable together, not having to put on a front with each other? * Have you created a cozy intimacy and understanding that no one else is allowed to enter? * Does he prefer to just hang around with you at home, more and more? * Does he treat you with respect and confide in you some of his secrets and fears? * Does he trust you with some of his most tender and sensitive thoughts? * Does he ask you for advice? * Do you laugh together? * Does he show you affection and thoughtfulness IN HIS OWN WAY? (Not your way)? If you can honestly say yes to most of these probing questions, then this is probably TRUE LOVE. And yes, he really does love you. We hope you have enjoyed this issue of Love Bytes Ezine. Each month, we will bring you another inspiring photo, quote or poem, plus fresh new articles on love, intimacy, dating and relationships. P.S. : For some great tips on keeping love alive, read more great advice from them that knows: Pearls of Wisdom.